The President should nominate, and the Senate should confirm, Christopher Krebs as Under Secretary for NPPD and then as the first Director of National Cybersecurity and Infrastructure Security. 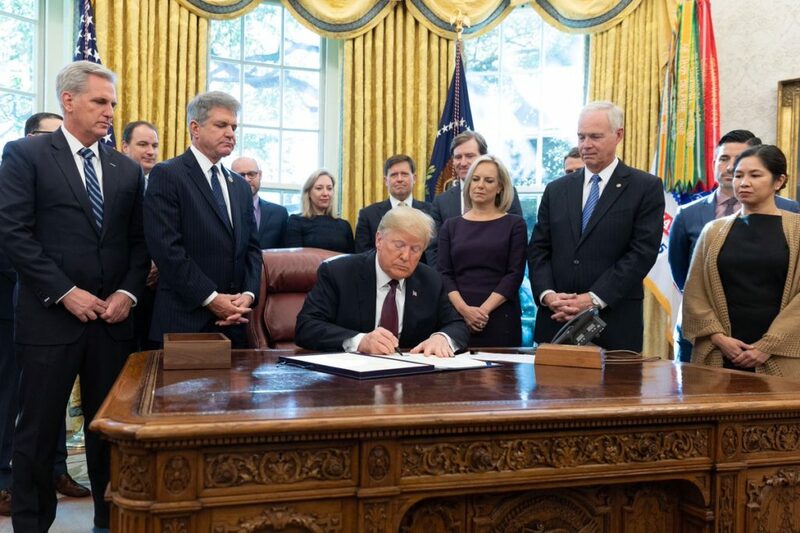 On 16 November, President Trump signed H.R. 3359, the “Cybersecurity and Infrastructure Security Agency Act of 2018,” into law, which re-designated the National Protection and Programs Directorate of the Department of Homeland Security as the Cybersecurity and Infrastructure Security Agency. In his remarks, Mr. Trump said, “Every day, America’s adversaries are testing our cyber defenses. They attempt to gain access to our critical infrastructure, exploit our great companies, and undermine our entire way of life. And we can’t let that happen. In our mission, Gate 15 regularly interacts with government partners at DHS, the FBI, across the nation’s fusion center community and with many others at the national, state, and local levels. We sincerely believe in the importance of private-public collaboration and, just as firmly, we believe this change will advance the ability for CISA to better support critical infrastructure security and resilience across the all-hazards environment – cyber and physical. With that, congratulations to all involved in bringing this change to fruition and on behalf of my teammates and I, we thank the continued service and leadership of the great team at the helm of CISA, including the newly minted Director, Mr. Chris Krebs, Assistant Director Manfra, Mr. Robert Kolasky, the incoming Mr. Brian Harrell, and all the women and men leading and serving the homeland security mission. Hostile events impacting critical infrastructure – directly and indirectly – are continuing, across the country and across the globe, and as I wrote last December, the future of cyberattacks will increasingly involve blended threats that will target our interwoven cyber-physical systems. “Such attacks will have greater and greater impacts across critical infrastructureand we, as a nation, need to properly organize ourselves and prepare for the changing threat and risk landscape. It is important to have a single, recognizable, federal entity leading this coordinated effort across the federal government, in collaboration with state and local governments, and vitally, with the private sector critical infrastructure owners, operators, and associations– directly and via their designated Information Sharing and Analysis Centers (ISACs) and the cross-sector National Council of ISACs. We’re very glad to see CISA become a reality and are grateful for and excited by the team leading this mission. Congratulations again. As we move to celebrate Thanksgiving, let us remember that many will be sitting on watch – whether supporting the CISA mission directly, in a private sector SOC or EOC, reporting on Americans deployed overseas in a number of official and other hostile areas, or one of many service members standing tall with the American flag on their shoulder. Let us give thanks, let us be grateful, and let us continue to remember what and who we serve and support – the United States, her people – citizens and all who look to America for inspiration with a heart to pursue the American Dream – and the ideas of freedom and opportunity that this Great Nation represents. “Thanksgiving Day is a time to pause and to reflect, with family and friends, on our heritage and the sacrifices of our forebearers who secured the blessings of liberty for an independent, free, and united country… We are especially reminded on Thanksgiving of how the virtue of gratitude enables us to recognize, even in adverse situations, the love of God in every person, every creature, and throughout nature. Let us be mindful of the reasons we are grateful for our lives, for those around us, and for our communities. We also commit to treating all with charity and mutual respect, spreading the spirit of Thanksgiving throughout our country and across the world. Regardless of our politics, I think we can all agree to that. Congratulations CISA, and Happy Thanksgiving. Andy is Gate 15’s co-founder and Managing Director.